Victoria Schade is an author, speaker, and dog trainer known for her upbeat approach to living and working with dogs. She has been featured in The Washington Post, Martha Stewart Living, Real Simple, Reader’s Digest, The Bark, and many dog-specific publications. Victoria has worked on Animal Planet’s annual Puppy Bowl special for the past twelve years. She has served as a pet expert for Petside, Pet360, petMD and PawCulture, writing training and behavior content and appearing in educational videos. Life on the Leash is her first novel. "My favorite part of this adorably smart story is the wealth of insight we get into the minds and behaviors of our most darling companions—not dudes, but dogs. 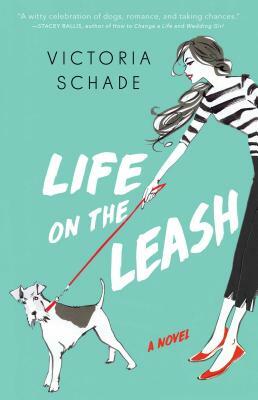 One of America's foremost pet trainers and a sparkling writer, in Life On the Leash, Victoria Schade proves herself as a bright new voice in fiction." "A bighearted and witty debut from a writer with remarkable insight into the minds of dogs and those who love them. The winsome cast of characters will have you hooked on Life on the Leash from the first page." "Playful, lovable, and heartwarming, Life on the Leash is the definition of feel-good fiction. Victoria Schade’s irresistible debut will have you cheering for dog trainer Cora, and the cast of charismatic characters, furry and non-furry. Add this to your to-read pile immediately!" "Even cat lovers will get wrapped up in this delightful story of girl, girl’s best friend, girl’s best girlfriends and a couple of guys. Cora’s canines in training will steal your heart. I couldn’t wait to see what happened next!" "A light, warmhearted romp... with an earnest, infectiously funny tone that dog lovers, especially, will find delightful." "Life on the Leash is the novel you've been waiting for all year - a strong, funny, big-hearted heroine to cheer for in life and in love, plenty of "I've-been-there" dating moments, and adorable, endearing, sometimes mischievous dogs to love on every page."